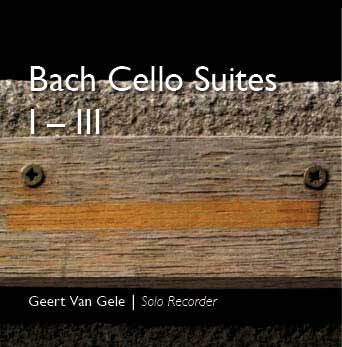 KA002: Bach, Cello Suites I-III, Geert Van Gele: The Six Suites for Unaccompanied Cello by Johann Sebastian Bach are among the world's most beloved pieces of music. Most likely composed during the period 1717-1723, when Bach served as a Kapellmeister in Cothen, the suites all have a similar structure, composed of a prelude, followed by the baroque dance forms of allemande, courante, sarabande, menuet I and II (bourree I and II in suite 3) and gigue. They cover a wide range of emotions and allow for vastly different interpretations, from the deeply intimate to the joyously extroverted. Since the time of Pablo Casals' first recording of them in the 1940's, they have been recorded by numerous cellists, and have been transcribed for numerous other instruments, including the recorder. In his search for his own interpretation of the first three of these masterpieces, Geert Van Gele found that he was led to different instruments, to dozens of venues, and through years of evolving in his performance of the suites. For Geert, spending time with these suites feels like taking lessons from a great teacher, he always leaves them feeling like a stronger, more focused musician. Three different instruments were ultimately chosen to bring out the different characters of the individual suites: The mild timbre of the "voice flute" (a tenor recorder in D) perfectly fits the calm maturity of Suite no. 1; the deep-sounding bass recorder embodies the melancholy drama of Suite no. 2; while the lively sound of the alto recorder sparkles with the youthful enthusiasm of Suite no. 3. After finishing his studies at several conservatories in Flanders with honours, Geert Van Gele went on to co-found the Flanders' Recorder Quartet. For ten years he performed and recorded with the Quartet in Europe and both North and South America. Along the way he won several important international competitions. He is regularly invited to give masterclasses. As a soloist he is admired as much for his interpretations of Bach and his performances of early Italian baroque music as for his mastery of contemporary recorder literature -- repertoires which he has all recorded on CD.